A line of electronic two-way metering valves is presented. High precision linear stepping motors drive the valve spindle. The resolution of the stepping motor driven needles is 0.0005"/step. Low differential pressure valves, may be operated continuously (100% duty cycle).Valves stay in position as when de-energized. 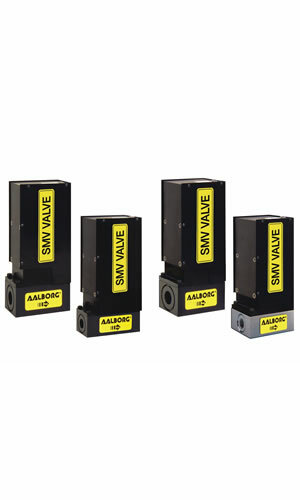 Advantages over solenoid operated valves include cool operations, i.e. there are no control operating problems due to coils heating up, extremely fine resolution, very low differential pressures and high operating pressures. Valves are controllable by TTL compatible logic level and analog 0 to 5 Vdc signals. When the "DIRECTION" is set LOW (GND) the valve spindle travels downward (closes), when it is set HIGH, the valve spindle moves upward (opens). The "SPEED" voltage on pin 4 determines how quickly the valve opens or closes. The signal amplitude for the "SPEED" control signal must remain within the limits of 0 to +5.0 VDC. It may be necessary to override "DIRECTION" and "SPEED" signals with the preset (2.75 Vdc) speed control signal. This can be accomplished with valve CLOSE and PURGE control signals (open collector NPN compatible). In order to CLOSE the valve, pin 3 on the 9-pin "D" -connector has to be connected to GND (pin 2). A GREEN light on the top of the valve will indicate a CLOSEd valve condition. In order to PURGE the valve, pin 7 on the 9-pin "D"-connector has to be connected to GND (pin 2). A RED light on the top of the valve will indicate a fully OPEN valve condition. During normal operation the valve remains in the last position as it is deenergized. After powering up, the valve will be automatically closed within the first 10 seconds and after that resumes control operation. Operating power and valve control signals are supplied via the “D”-connector.